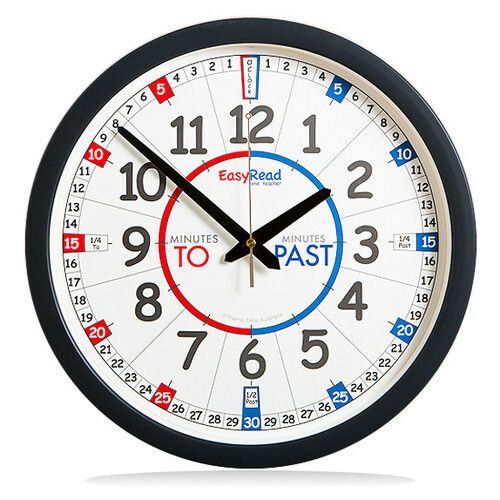 The EasyRead Time Teaching System was designed by award winning designer Roger Shackleton. It guarantees ease of learning for children to read the time in terms of ‘minutes past’ and ‘minutes to’ the hour using the unique EasyRead 3-Step Teaching System. The 3-step teaching system is easy to learn and remember. "These clocks are a fantastic learning tool for students of all ages - easy to read and educational. A must have in every classroom!" "I love this clock, it has really helped my son in telling the time and understand of the time terms we use." "I purchased this clock to put up at home to help my son to tell the time. It helps reinforce what he learns at school in a more casual environment."